What Day Of The Week Was April 12? 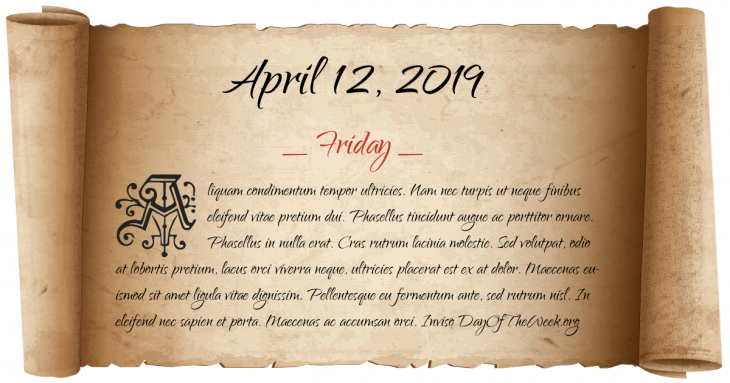 April 12, 2019 was the 102nd day of the year 2019 in the Gregorian calendar. There were 263 days remaining until the end of the year. The day of the week was Friday. The Union Flag is adopted as the flag of Great Britain. The SMS Zrinyi, one of the last pre-dreadnoughts built by the Austro-Hungarian Navy, is launched. Samuel Doe takes control of Liberia in a coup d'état, ending over 130 years of minority Americo-Liberian rule over the country. Terry Fox begins his “Marathon of Hope” at St. John’s, Newfoundland. Jim Gary’s “Twentieth Century Dinosaurs” exhibition opens at the Smithsonian Institution National Museum of Natural History in Washington, D.C. US President Bill Clinton is cited for contempt of court for giving “intentionally false statements” in a sexual harassment civil lawsuit. A female suicide bomber detonated at the entrance to Jerusalem’s Mahane Yehuda open-air market, killing 7 and wounding 104. A train derails near Merano, Italy, after running into a landslide, causing nine deaths and injuring 28 people. Who were born on April 12?